It has been several years since I visited the Blue Door Pub, so on a beautiful summer night I made the ride to St. Paul to see if the burger was better than my previous visit. People in the office keep telling me to return, so tonight was the perfect opportunity. I was fortunate when I arrived that a table was open outside. The hostess did forewarn me that no alcohol was allowed at the outside tables but since I do not drink this was not an issue. A quick perusal of the menu and I was set. The “Blucy” ($7) was not my favorite the last time so I decided on a “Breakfast Blucy” ($9), which tops a basic Blucy with more cheese, a couple of slices of thick bacon and a fried egg. I also substituted onion rings for the fries for an additional $3. 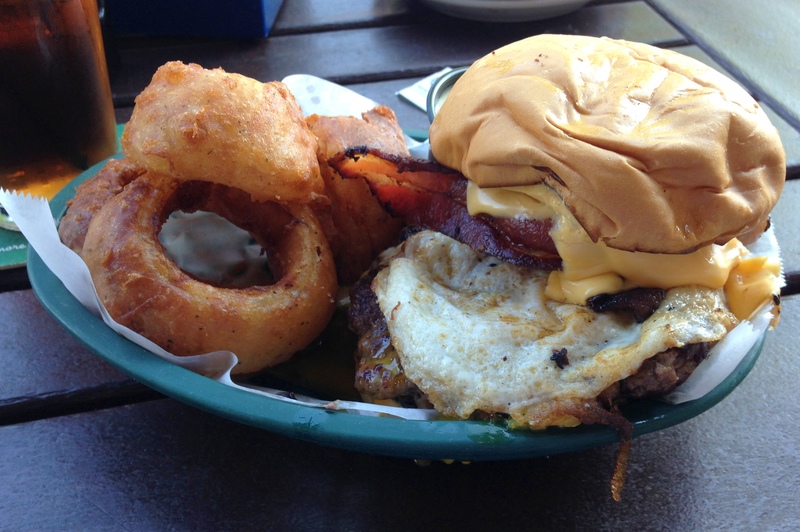 The burger arrived in its plastic basket along with four onion rings. Fortunately they have a pile of napkins on the table, since lifting and taking the first bite of this burger is a messy feat. The initial impression was not favorable. The meat was basic, lacking any flavor and without seasoning. The bacon was strange. It looked crispy but the fatty part was soft, the same texture when it is raw, the cheese was good and the pickles added flavor to the burger. The egg contributed a little creaminess and crispy texture. There were so many toppings that the bleu cheese on the interior was lost. Together this was an OK burger, nothing special. The onion rings were not good. They were crispy on the exterior but barely cooked on the inside, still maintaining the onion’s raw pungency. Overall the visit was no better than last time. Others may love the Blue Door, but I am still not a fan. For some unforeseen reason I suggested to two colleagues that we venture to Kona Grill after 10 straight hours of meetings. Parking was easy on a Tuesday night and there was a 20-25 minutes for a table but one was opening in the bar area so we grabbed it. The place was filled with 20-30 year olds, with lots of energy and it appeared that everyone was enjoying both the vibe and the food. Our server arrived at the table with menus. Her enthusiasm was fantastic as she described many of the specials that she liked. I love it when the enthusiasm of a server truly believes the food at her restaurant is fantastic and my server at Kona Grill fit that bill to a tee. As I looked through the maki combinations I had a bad feeling since most of them contained the words “spicy,” “cream cheese” and “mix.” The chefs were definitely placing an interesting mark on dishes. From the top. The potstickers were filled with seared chicken and vegetables, served with Asian slaw and a traditional dipping sauce. The plate was extremely hot when it arrived at the table so be careful. The dough was gummy and flavorless and the filling was bitter and off-tasting. One bite and I was done. The calamari was served with a spicy aioli and I strongly suggest you take advantage of the dipping sauce as the fried calamari were also flavorless and lacking any seasoning. The tacos (I know…what was I thinking?) were two deep fried flaky shells filled with marinated beef and Asian slaw. The kitchen was attempting to re-create a beef version of Peking Duck and they failed miserably. The Hoison sauce was over-applied, overwhelmed the other ingredients and the three of us barely finished one of these shells. As we were eating the appetizers, our salads arrived, so the table was getting crowded. The eel and avocado roll was divided into eight small pieces and then the kitchen doused the pieces with the fish sauce. It was sloppily constructed, falling apart as each piece was lifted with chopsticks and the fish sauce overwhelmed the dish. After I ate three of the eight pieces I decided to stop and wait for my entrée. The food runner arrived with the entrées while there was not a spare inch of table geography available. It was almost amusing watching the staff pile dishes in one hand, move plates around, place one down and begin this dance from the top. It was like a teenage Keystone Cops routine. I sat back and watched as they successfully completed the food exchange. My sea bass was served with shrimp & pork fried rice and pan-Asian ratatouille. It is hard to decide which of these three items I disliked the most, since they were all equally inedible. The texture of the fish was horrible, it was probably frozen with the marinade since the flavor of the miso-sake marinade was overwhelming. The fried rice was probably prepared earlier in the day and scooped out of a cafeteria chafing dish and likewise with the overcooked and incredibly limp vegetables. Two bites of fish and one bite of each of the sides and I was done with dinner. To the server’s credit, on her third pass of the table with my entree entire uneaten and after delivering the bill she asked about my fish. When I used the word “inedible” she was spot on in removing the check from the table and removing the uneaten fish from the bill. Maybe checking in earlier would have been a good idea. It was not her fault that the kitchen prepared some of the worst food I have eaten in many years. She was enthusiastic from the moment we arrived in her section until she removed the inedible fish from our bill. Overall, I cannot see one reason to return to Kona Grill. From the first bite to the last it was one of the worst meals I have eaten in quite some time. 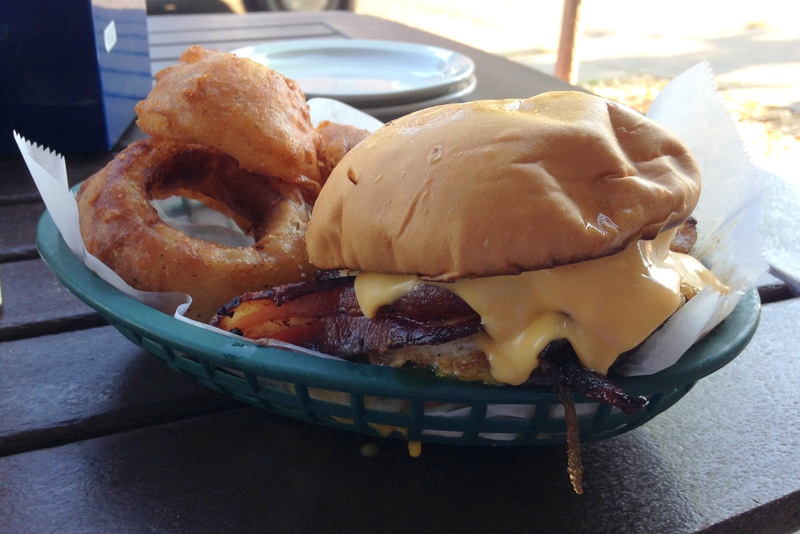 Kincaid’s in Bloomington is a lively restaurant serving OK food. The prices are downtown steak house levels, the décor is downtown, but this restaurant is located in an office building in Bloomington, there to cater to the business crowd in the building and the surrounding neighborhood to avoid the traffic downtown, which was why we were there. The menu is heavily focused on steaks, with numerous cuts and sizes. On my latest visit I was more interested in a lighter meal and when the server informed the table that one of the special for the evening was Halibut Cheeks, I was excited. I think the cheeks on most animals and fish are the best part so I was keen to give it a try. I was a little hesitant when he mentioned they were rolled in Asiago and Parmesan cheeses and fried, but decided to order anyway. For my appetizer I chose the lobster bisque. The bisque arrived for assembly. A bowl was placed in front to me, which contained a smidgen of diced lobster meat. The server slowly poured the bisque around the diced lobster. It was extremely thick and full of cream…this was not a dieter’s rendition of a classic dish. Overall the bisque had a decent flavor, but the cream overwhelmed the other flavors and the lobster meat was almost flavorless. The Halibut cheeks arrived, served with succotash and grilled asparagus. This was a good sized portion, five fried cheeks. The flavor and texture of the cheek meat was great and the kitchen prepared the doneness perfectly. I was not that fond of the cheese crust, it fought the inherent sweetness of the cheeks. The sides were not good at all. The succotash should have contained bright flavors given the time of year, but the vegetables were tasteless, and the asparagus were worse. The kitchen did not trim the bottom nor cook them sufficiently so they were borderline inedible. I give a very good to the cheeks and a bad job to the sides. The dessert menu was presented and the server was recommending the bread pudding. After receiving and tasting it, the kitchen must have told the staff to push it. It was horrible. Here is a recommendation to all servers…if you need to apologize to the guest while pouring the sauce on a dish, remove the dish. The server apologized about the thickness of the bourbon sauce, why he did not remove it altogether is a mystery. A bigger mystery is why they served the bread pudding at all. It was a slab of bread, burnt on the bottom with a little ice cream on top and an overly thick bourbon sauce. I had two bites and decided it was not worth the calories. Overall, Kincaid’s is trying to be a high end steak house that does not produce the product commensurate with the prices. The food was fair at best, the kitchen sends out items that never should leave the kitchen but the staff is spot on in hawking the products. A quick customer lunch at Redstone was very good. The food is very consistent, nothing earth-shattering but you can count on the same dish every time you go. The servers at Redstone are incredibly trained to hawk the shared appetizers, they are pros at the sales pitch and in 100% of my visits, someone at the table says, “Oh yeah, let’s order a few.” It’s a great business model and my hats off to the management for the training. On my recent visit we ordered the “CRISPY CALAMARI” and the “SEARED AHI TUNA” to share. The calamari shared the dish with a fried spicy pepper mix and a chipotle aioli. The dish included both rings and tentacles, breaded and fried to a crispy exterior while maintaining a soft interior. The flavor was very good. If you like a little kick, combine one of the fried pepper pieces with the fried calamari and cool with a little aioli. The tuna was crusted with sesame seed and black pepper, seared and served atop Asian slaw, with a wasabi and soy-lime sauce. This is almost standard fare these days and the thrill is somewhat gone from eating this recipe. Both of the appetizers are standard at Redstone and they prepare each of them consistently. There are four burgers on the menu, two of them are beef. I wanted to order the “REDSTONE,” which includes cheddar cheese, applewood smoked bacon and barbecue sauce, but mistakenly ordered the “ORIGINAL” (medium-rare), which was served with shredded lettuce, tomato, mustard, mayonnaise and homemade pickles. As a side I ordered the French fries. The burger was cooked a little beyond medium, which was disappointing. The flavor was very good, not great but I am not a fan of mustard on a burger, preferring ketchup so I ate the patty without the top bun so I could add the ketchup. The fries were also very good, crispy on the exterior and soft on the interior. Again, there was nothing special about the burger, just a consistent product. Overall Redstone knows what it is, it hustles the shared appetizers and delivers basic American restaurant fare…nothing special. What better way to spend a beautiful summer night than with family enjoying al fresco dining. Sitting on Summer Street in Stamford is not exactly La Rambla in Barcelona, but the food at Barcelona Wine Bar is a good substitute in this part of the world. We ordered a variety of tapas over the course of the evening. My two favorites were the “Grilled Hanger Steak” ($9.50) and the “Crispy Calamari” ($10.50). The seven small slices of steak were served with a black truffle vinaigrette. Ordered medium rare the kitchen prepared it exactly as ordered. The meat was rich in flavor and the sauce added an earthy quality. The calamari was served with a smoked pepper aioli. Both heads and body pieces were included and unlike other restaurants that serve calamari as rings, Barcelona’s are prepared as larger curly-square segments. The kitchen then fried these pieces perfectly. Dipping each piece into the aioli created a wonderful combination of texture with just a little spiciness. A long-time favorite, the “Mushrooms and Herbed Goat Cheese” ($8.50) was also delicious. The mélange of wild mushrooms were served in a balsamic reduction with a dollop of the herbed goat cheese sitting atop. The deep flavors of the mushrooms were complemented with the balsamic reduction and then offset with the creaminess of the cheese. A complete disappointment was the “Gambas al Ajillo” (9.50). They were served nakedly in a dish with garlic, Guindilla pepper and Sherry. I can only assume that there were so many sold in the previous two weekend evenings that we received the last of the inventory. Six meagerly sized shrimp were included in the order and these were badly prepared. This dish was more in line with Red Lobster than Barcelona, one bite was enough. We always leave room for dessert as the “Crepas Salguero” ($8) never disappoints. Two crepes are rolled around a sweet and delicious Dulce de Leche, then topped with chocolate sauce and a scoop of vanilla ice cream. The crepe is a great canvas for the three sweet additions. We normally share this dish. The service on this night was downright annoying and intrusive, constantly interrupting the flow of conversation at the table. She was totally unaware that her interruption to ask us to order more tapas reminded everyone at the table of a hawker at the street fair. Management needs to explain the proper way to approach a table. I have seen this on several occasions at the Barcelona chain but this was probably the worst. Overall it was a wonderful evening at Barcelona, in spite of the amateur service, and I look forward to many more evenings enjoying the great flavors emerging from the kitchen. With all the positive reviews and posts about Pontos Taverna we decided to have dinner after a movie at the Garden Cinema. Our impression was quite different from all the positive accolades. After a movie expect to wait for a table but ours was well within the 20 minute estimate the young lady mentioned when we left our name with her. Both she and all of the staff were incredibly pleasant throughout the evening, many restaurant should send secret shoppers to Pontos to learn from them. The interior is a cross between a cafeteria and a beer hall. No ambience whatsoever, no music at all, just the loud din of other guests…the ambient noise is deafening. We decided to order a couple of appetizers while we looked through the menu. As I looked for an entrée I saw several marked “MP”…I would like to know the prices, but they were all reasonable when asked. 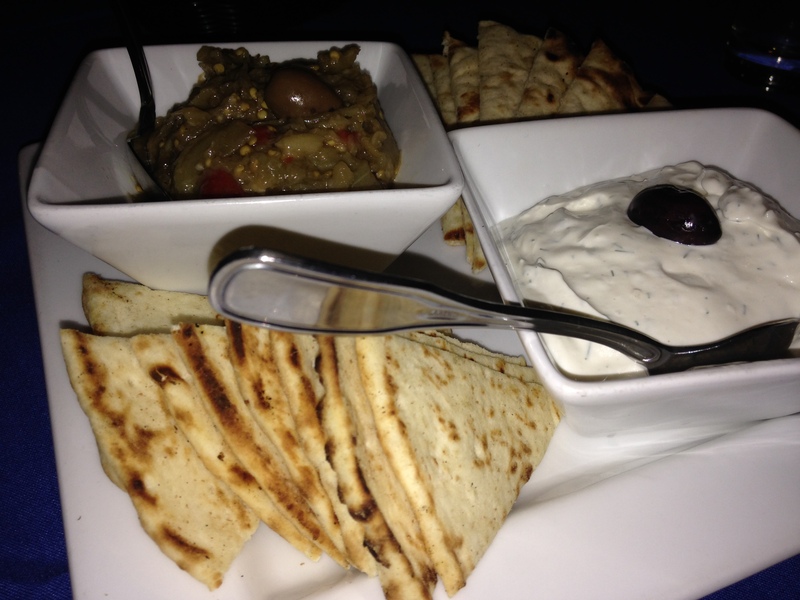 The Tzatziki was very good and offered a bright refreshing start to the meal. The Melitzanosalata included too much garlic, which overpowered the eggplant. 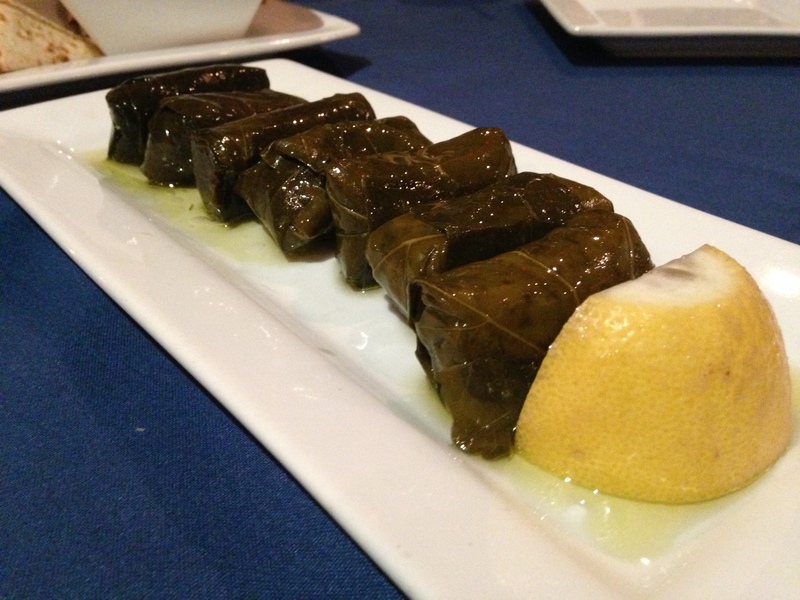 I liked the Dolmades, which were mild and not overwhelmed by lemon. 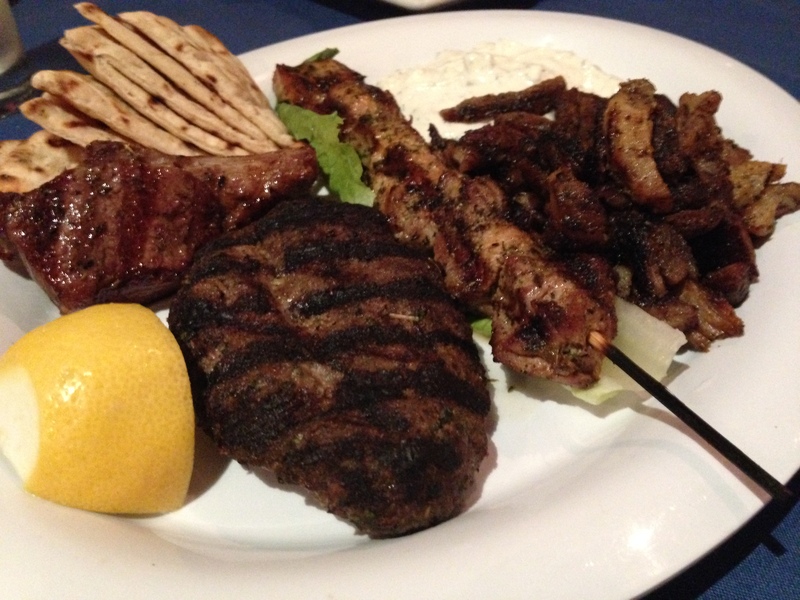 I asked our server what she would recommend and with her reply “everything” I ordered the sampler plate, which included a lamb chop, a Beeftkia beef patty, a chicken Souvlaki skewer and gyro meat, served with Tzatziki. My wife ordered one of the specials of the evening, the sautéed Bronzini. The server forewarned us that the fish was served with no sides, but we still had appetizers on the table so it was fine. The sampler was a hefty dish. The basic comment is that everything on this dish was overcooked. The miniature lamb chop was served well done. My two bites indicated that it was perfectly seasoned, but lost all its juiciness from the preparation. The beef patty was crispy on the exterior and firm on the interior. The pillowy interior I was looking for was not present. The chicken was the best of the dish, it still maintained a modicum of juiciness but was more dried out than juicy. The gyro meat was inedible, incinerated and no amount of Tzatziki could bring it to back to life. My wife’s fish was very tasty and cooked to the correct doneness but was smothered in oil, eating both filets was not possible. It was obviously a different experience for us than many others. The front of the house was excellent but the kitchen was not up to the hype that others have mentioned.